The IRS sends out millions of notices and letter to taxpayers every year. While not all are audit notifications, when you do receive an audit notice, you will have to have someone on your side, working with you, in your defense. 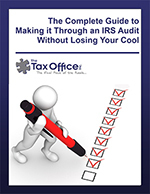 Do You Know What to Do If You Receive an Audit Letter from the IRS? 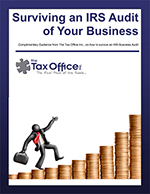 Start your defense with these complimentary white papers and guidance from The Tax Office, Inc. The Tax Office, Inc., will work with you every step of the way – answering questions, preparing and gathering documents, and even serving as your representative. In fact, our clients often have little or no direct dealing with the IRS because we handle all meeting, all correspondence, and all negotiations on your behalf.